Come check out the new look! We’re happy to announce our new site update is done. Now featuring more information, updated products, and all the features you’ve come to expect from Anion. 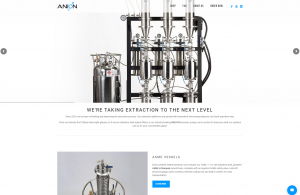 Take a minute to stop by and browse our unbeatable line of extraction equipment! CK: is one of the leading design engineering innovators behind the Anion TRIFECTA and Anion MINIFECTA extraction platforms. With over 14yrs experience in design, implementation, and manufacturing, CK plays a pivotal roll in the company. Since 2016, we’ve been re-thinking and improving the extraction process. Our extraction platforms are packed with innovative, time-saving features not found anywhere else. From our industry-first 350psi inline sight glasses, to 5 micron stainless steel butane filters, to our industry leading GOLIATH recovery pumps, we’re excited to show you what our systems can do for your concentrates game.